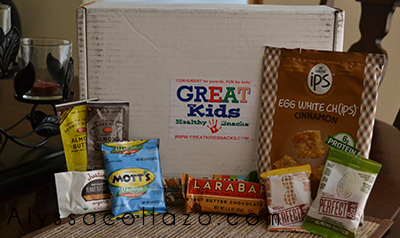 Your monthly GREAT Kids Snack Box will include 30 individually wrapped snacks. Each snack has been carefully selected to enhance your child's mental and physical well-being. This includes, but is not limited to, improving your child's mental alertness and focus in the classroom, along with increasing energy and performance during athletic and physical activities. The GREAT Kids Snack team selects those foods that are organic and all-natural, with nothing artificial added to them. Kids bodies are still growing and they need essential vitamins and minerals in their diets as their bodies are developing. Monday - Barney & Co Almond Butter Honey + Flax and Cocoa + Coconut - I included both of these in her snack because she woke up with a sore throat and I figured the Honey would help. She liked both flavors but favored Cocoa + Coconut a little more! Tuesday - Mott's Medleys - Another gummy snack that Lily really enjoyed. Wednesday - Justin's Dark Chocolate Peanut Butter Cup - We love Justin's and Lily was so excited to see it was included in her Snack box. Thursday - KIND Fruit and Nuts in yogurt - Another favorite in our house. We constantly buy KIND but this was Lily's first time trying this flavor and she LOVED it. Friday - Lily had two snacks on Friday (One for School and the other for Dance) Larabar Peanut Butter Chocolate Chip - We have seen these in the store plenty of times but Lily never seemed interested, She really enjoyed this bar and was a huge fan of the flavor. Mini Perfect Bar Almond Butter and Peanut Butter - These snacks are adorable and delicious! Lily liked the size and the fact she was able to have two mess free snacks during dance. Saturday - ips Egg White Chips Cinnamon - Lily is HIGHLY allergic to egg whites, so she wasn't able to try these but her little sister Soph did and loved them, especially the cinnamon flavor. This is our last week for this fun snack subscription box and Lily loved everything. She was a little sad she couldn't try her ips chips but overall she liked trying the new stuff she picked. Be sure to check back next week for the wrap up post of our Great Kids Snack Box adventure. And in the meantime enjoy a 25% off discount on your first GREAT Kids Snack Box using code “GKSB25". I've never heard of Great Kids but this sounds really cool. It would be nice to have pre packaged snacks to send to lunch with the kids. I like the variety and some of them are really interesting sounding too... Egg white chips? I'm sorry your little one couldn't enjoy them, but they so sound so very interesting. I too never heard of Great Kids. I need to look into this, as it will save me time in the morning. I've never heard of Great Kids but it looks like is filled with good and healthy products. Its like a snack version of Glossybox, cool! Looks awesome, hope we get something like this in SA soon. I never hear of this box. Thank you for sharing this post. Hmmmm...the Almond Butter snacks sound like they taste good - will have to be on the lookout for that. Justin's Peanut Butter Cups are also really tasty. I like the milk chocolate ones. I'm also a fan of Larabars - the Cherry Pie one is truly addicting. I also didn't know they made Cinnamon-flavored ips. This looks like a great snack box. My kids already eat some of those! I've never heard of this before but it looks like they've got some great stuff inside! Very cool! We've never tried this. Haven't tried any of those snacks either. Maybe I will get my son some for him to try. This is a great time saving idea. Thanks for sharing about this service. It sounds like the snacks were tasty! These sound great for snacks! I'm always in the look for creative ideas and different options. Thanks for sharing, Alyssa! A food diary's a cool idea. It's too tempting to cheat on this cause I'd surely want to trade. That kids snack box looks awesome! Never knew about it until now. Sounds like something my kids would try. I really need to look into this! I love subscription boxes and healthy snacks! Wow all of these snacks look amazing. Wow yum yum! Hihi this is a good way to save up! Interesting subscription box! I like that theyir goal is to provide healthy snakcs for kids! Personally, I'm a junk food junkie but I think i'd like these! I've never heard of great kids before. But it's really nice and handy and seems to save up on snacks way better compared when you buy it individually, it's like glossy box for snacks how neat! Looks like they have nice yummy healthy snacks, especially the Larabar, those are our favorite! What a fun way for kids to be excited to try new foods, especially healthier foods. This is a great box. Wow this is fun - I bed the kids here would enjoy this too. Larabars are my favorite! Sounds like a wonderful subscription box company. I love this subscription box! What a great idea to make sure your kids eat healthy! I've never thought of trying a snack subscription box before. It seems like it lessens the hassle of putting something together every day. That Lara bar looks SO good. Would love to try. I am jealous you guys have this kind of stuffs going on.. I wish we also have this kind of box here in the philippines.. Those stuffs are awesome! What a cool little snack box. I'm getting hungry now after reading this! I really want to try those egg white chips! How interesting! I´m no longer a kid but right now I´d love a snack to improve my mental alertness and focus plus increased and performance ! We don't have snack boxes here in our country and seeing those makes me want to live there.